61 of 63 people found the following review helpful. X-10 works fine when it works. Don't expect it to always work. This review and the three stars are not so much for this particular X-10 device but for X-10 as a system. X-10 is still just about the cheapest home automation product that exists. However it is not without its drawbacks. Most of these are caused by modern equipment and devices that were not even dreamed of when X-10 was designed. When it works, it can be wonderful. But the X-10 powerline signaling mechanism was designed in the late 70s. This means it predates switch-mode power supplies (which are universal in home computers and laptops, are used in most modern "power bricks" and "wall warts", and are also used in much other modern gear), WiFi, compact fluorescent lamps, LED lamps, UPSs, and even surge protector power strips. Most of the above types of devices generate noise on the power line, and this noise can interfere with X-10's signals. Others actively *filter out* the X-10 signal. It is important to understand that the X-10 signals are sent during the "zero-crossing" period of the AC power waveform. They are weak (low voltage) signals well outside the AC power frequency range. In other words, when seen in an otherwise pure AC waveform, X-10 signals look like noise! So the noise filters in things like "surge protector" power strips, and even in much electronic equipment, will therefore reduce or even eliminate the X-10 signal! It's not their fault - it's what they're *supposed* to do. And the more surge protector strips you have in your home, the worse this gets. Note that this does not apply only to the equipment that is plugged into the power strip. It also will likely apply to stuff plugged into the same outlet as a power strip, or even to nearby outlets on the same circuit. As a result of both increasing numbers of electrically noisy devices, and increasing numbers of "surge suppressor" power strips, X-10 has been getting less and less reliable over the years in many users' homes. This has nothing to do with the X-10 modules or controllers. They're the same as ever. It's the other stuff in our houses and this is only going to get worse. You can have a setup that works perfectly most of the time... and then mysteriously starts ignoring signals from one particular controller. Or one module will start ignoring commands. Later it will just as mysteriously work perfectly again. In my experience these problems are usually caused by a "noisy" device, like a laptop with a particularly noisy power brick, that is plugged in or switched on sometimes and not at other times. Moving the affected controller or module to another outlet - especially one on a different circuit - will sometimes help, sometimes make the problem worse. Occasionally, *adding* a particular appliance or lamp to the house will make X-10 work *better*. And so it goes. Conclusion: For X-10 to work is no longer the "slam dunk" assumption it was decades ago (yes, decades!) when the system was introduced. If you want much more reliable home automation you're going to have to go to something else, like Z-wave. Of course that will be much more expensive, but... life is full of those tradeoffs. These are extremely useful and very reasonably priced modules. 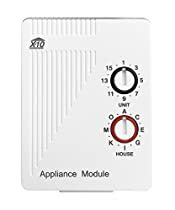 I've used them for a wide variety of tasks such as turning lights on/off, starting/stopping small appliances, even controlling large 1200 watt heaters. I have about six of them, and after several years of service, they're all still functioning. I highly recommend these units! Of course, you need some kind of X10 controller to control them. 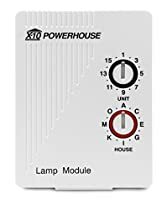 If this module (or any other X-10 module) doesn't always work or won't work in certain receptacles it is probably due to weak signal strength and/or interference. There are many web sites that explain this and how to remedy the problem. Electronic ballast energy-saving fluorescent light bulbs can render X-10 systems completely inoperative. Some computers, cell phone chargers, battery powered drill chargers, etc. can also cause X-10 to act unreliably. The problem applies to the X-10 system in general, not the AM466 module in particular. The module does make a loud mechanical "clunk" when its internal relay operates. 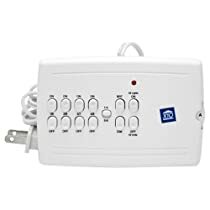 I use several of these to control holiday lighting displays so they all turn on and off with the press of a single button, regardless of their location in the house. Very convenient and versatile, especially when used with the wireless controllers or the computer interface module.